On this date in 1480, Ottomans invading Otranto, Italy conducted a mass execution of prisoners. Landing at the southern Italian city on July 28, the Ottoman force quickly overwhelmed Otranto. (Otranto rashly slew the messenger come to offer a merciful capitulation, only to find that its garrison began deserting within days.) On August 11, the Turks took the city by storm. Thousands died on that day’s bloodbath, including the Archbishop of Otranto. Surviving women and children were sold into slavery. Men over age 15 had the choice of conversion — or death. 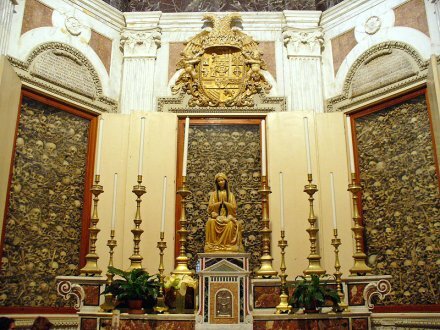 The remains of the Otranto martyrs, arrayed as relics in the Otranto cathedral. (cc) image from Laurent Massoptier. Historical novel set during these vents. This, at least, is the most pious version of the story. The mass execution certainly did occur, but some latter-day historians like Francesco Tateo have argued that martyrdom is not attested by any of the contemporaneous sources, and the specifically religious understanding of events was only read in after the fact. In the ensuing months, they rallied together vowing to expel the invaders. Fortunately for this coalition, the Ottoman sultan Mehmed the Conqueror died in May 1481, and a brief period of internal conflict within the Ottoman empire over the succession perhaps led it to allow its Otranto outpost to wither on the vine. The Turks made peace and withdrew from their potential beachhead not long after, having held the city for just over a year. The bodies of the martyrs were said to have been found uncorrupted by decay. The Catholic church beatified the 800 martyrs in 1771, but their final elevation to sainthood occurred only in 2013, just three months ago as I write this. They were in the very first group canonized by the new Pope Francis — although the canonization was approved by his predecessor Benedict XVI on the same day that Benedict resigned his pontificate. Considering current relations between the respective faiths, it was seen as a potentially impolitic move. “By venerating the martyrs of Otranto, we ask God to protect the many Christians who in these times, and in many parts of the world, are still victims of violence,” Pope Francis said at the canonization Mass, diplomatically not naming any of those parts of the world. * At the same time, Florence (in common with other Italian polities) had trade and diplomatic relations with the Ottomans.